Associate Justice Esperanza R. Fabon-Victorino is the newly appointed justice of the First Division of the Court of Tax Appeals. Before entering the legal profession, she was in the radio broadcast industry, having graduated with a Liberal Arts degree in Communication Arts from the University of Santo Tomas. As a broadcaster, she earned a Catholic Mass Media Award in 1986 for Best Public Service Program for giving free legal aid to the poor in her radio program over DZBB. She also received a plaque of recognition during the EDSA Revolution for her radio program "Espie Espesyal". With the encouragement of her late husband, she pursued further studies in law from the University of Santo Tomas and was admitted to the bar in 1982. She also took masters in Business Administration from the Ateneo Professional schools and later on took graduate studies in law from the San Beda College. In 1987, she joined the Office of the Solicitor General and after serving in the OSG for more than ten years, she became the Presiding Judge of the Regional Trial Court, Branch 157 in Pasig City. Her commendable work ethics and consummate skill in the disposition of cases during her 12-year service in the RTC earned recognition of respectable award-giving bodies. 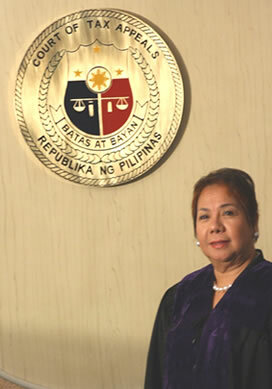 She was awarded Outstanding Government Service Award by the Guillermo Mendoza Memorial Scholarship Foundation, Inc. and National Maagap Award - Women Sector by the Organized Response for the Advancement of Society, Inc. With her sterling reputation and track record in the judiciary, Judge Victorino has been a consistent finalist to the Judicial Excellence Award since 2005. She was married to former Major Jaime C. Victorino with whom she has three children: Margarita Eugenia, a lawyer at the Office of the Solicitor General, Magnolia Eugenia, an Italian trained chef, and Eugenia, a scholar of the Italian Government finishing her PhD in Economics. Her single-handed parenting to her children, an epitome of self-denial for the sake of family earned for her the Alay Kay Inay Award from the Gintong Ina-Ama Foundation, Inc. She is also a recipient of Ulirang Ina Award for Law and Judiciary given by the National Mother's Day and Father's Day Foundation of the Philippines, Inc.